by Purcell, Edward M.; Morin, David J. 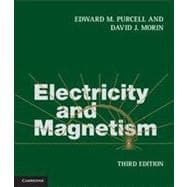 For 50 years, Edward M. Purcell's classic textbook has introduced students to the wonders of electricity and magnetism. The third edition has been brought up to date and is now in SI units. It features hundreds of new examples, problems and figures and contains discussions of real-life applications. The textbook covers all the standard introductory topics, such as electrostatics, magnetism, circuits, electromagnetic waves and electric and magnetic fields in matter. Taking a non-traditional approach, magnetism is derived as a relativistic effect. Mathematical concepts are introduced in parallel with the physics topics at hand, making the motivations clear. Macroscopic phenomena are derived rigorously from microscopic phenomena. With worked examples, hundreds of illustrations and nearly 600 end-of-chapter problems and exercises, this textbook is ideal for electricity and magnetism courses. Solutions to the exercises are available for instructors at www.cambridge.org/9781107014022.